Does Sour Cream Go Bad if Unopened? Why Does Greek Yogurt Have More Protein Than Regular? A bowl of greek yogurt with fruit. 1 Does Sour Cream Go Bad if Unopened? It used to be that shopping for yogurt was a matter of choosing a flavor and container size. Greek-style yogurt companies have made a name for their product by touting protein-content, too. 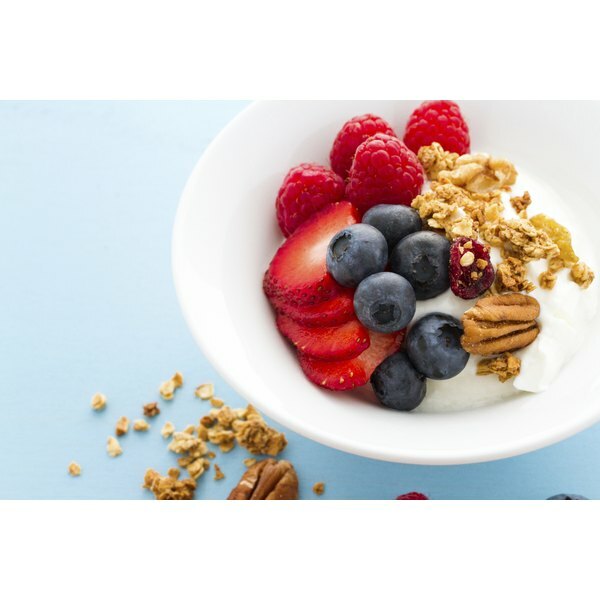 According to the U.S. Department of Agriculture's National Nutrient Database, a 6-ounce container of regular yogurt has a mere 8.9 grams of protein compared to the 17.3 grams found in the same serving of Greek yogurt. The manufacture of regular and Greek yogurt begins with the same process. Milk is heated and seeded with live, active cultures, including Lactobacillus bulgaricus and Streptococcus thermophilus. The bacterial cultures transform the milk into yogurt in a process called fermentation. The reason Greek yogurt has a higher protein content is that it is a much more concentrated product. After the milk has fermented, manufacturers strain the yogurt extensively to remove liquids. The end result is much thicker and more protein-dense than regular yogurt. Can You Substitute Yogurt for Shortening?